Paper Bags are a thrifty and versatile crafting material. Check out all the ways you can transform an ordinary brown paper bag, starting with this DIY crown. Let's have some fun pretending to be the queen. Children will love this paper crown made from a Trader Joe's grocery bag. These bags come with clip art already printed on them, so all you have to do is cut the bag into the shape of a crown and add bling to make it sparkle. Transform a boring brown paper bag into a bold, colorful party piñata. This is so much more fun and less expensive than buying a piñata at the store. You almost won't want to bust it open. This craft is especially easy to make because it does not require papier mache, so there is no mess when you make it. Dress up your child's simple paper lunch bag with a paper punch and leftover ribbon. You can quickly transform the plain Jane lunch bag into a fancy-schmancy container for your kid's lunch. Little girls will especially love having their midday meal packed in one of these sacks that are so pretty and so feminine. This craft has got to be one of the most unusual ways to repurpose paper bags. Did you know that you can turn brown paper into faux wood floor planks? Cut brown paper bags into plank shaped strips, add brown paint and transform it into faux wood with a graining tool. Let it dry and then glue the paper "plank" onto your subfloor. Top it off with polyacrylic meant for floors and you have a floor that looks like weathered barn planking. Mike Jenkins is an artist who decided to brighten up his daughter's day by drawing a cartoon on her lunch bags to make her smile. These are not your ordinary doodles but bonafide works of art. He certainly should be nominated for the "Dad of the Year Award." Kids at school and their teachers noticed the artistic lunch bags and spread the word. Mike now has a total of 420 decorated lunch bags on exhibition. Although most parents are not as talented as Mike, you certainly can be inspired by his dedication to making his daughter happy at lunchtime. Why not decorate your child's paper lunch bag with your doodles to show how much you care? Autumn is a great time to make paper lanterns. Place colored leaves in between sheets of wax paper and incorporate them into your light craft. Make the top and bottom of the light from paper bags to add some rustic charm. The results are quite stunning. 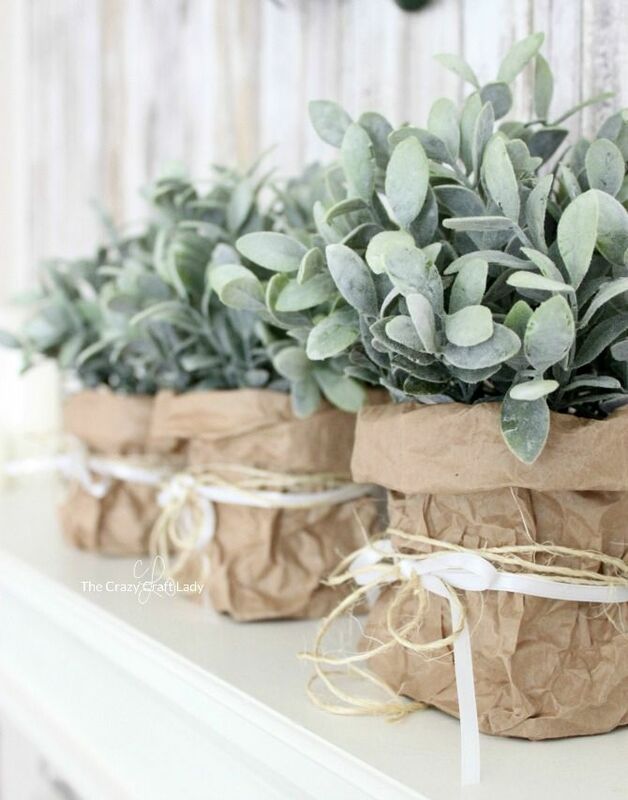 Dress up your houseplants with ordinary brown paper bags. For natural charm, just place your plants into folded crumpled paper sacks and tie with twine and ribbon. Your plants are ready to be given as gifts or put on display. What a quick and easy way to make your plants go from drab to fabulous! Transform fresh cut flower bouquets into elegant gift packages with black paper bags. Place your arranged bouquet into a glass jar filled with water, and put it into a folded black paper bag. Print your sentiment onto a label and stick it onto the bag. You now have a beautiful gift that took only a few minutes to make. Turn an ordinary inexpensive glass vase into a faux leather beauty. Brown paper bags are torn into pieces and glued onto the glass jar with mod podge. After the paper dries, it looks very similar to leather. Make a paper football for those rainy days when your children cannot go outside to play. Let them toss the paper football inside. You will not have to worry about damage to your furniture or walls with this paper toy—a win for all concerned. Why are pirates called pirates? Cause they arr. Your children will have lots of fun making and playing with these cute paper bag pirate puppets. Are you looking for a gift that is easy, cheap and adorable? Turn a lunch bag into the cutest coupon book. What a delightful way to show someone just how much you love them! A Paper Bag Coupon Book for Kids from Small Fry & Co.
Whooo doesn't like a party? Celebrate the end of the school year with this "Wise Old Owl" treat bag. This paper craft is perfect for preschool children. Make a bird's nest from torn paper bag strips and mod podge. This craft is simple, fast and easy. Everyone is guaranteed success with this project. There is no failure when it comes to constructing a paper bird's nest. Make a stunning pendant lamp shade from a grocery bag. This lamp is truly a work of art. You will be proud to display this paper craft light in your home. Get ready to stand back and receive compliments from your guests when they admire your crafty skills. You can find colored lunch bags in any stores party supply section. Learn how to transform these bags into cute paper stars. Make several and hang them as party decor for your next occasion. If you like the look of paper bag stars but want to add your artwork, just use brown paper bags with your creative drawings. 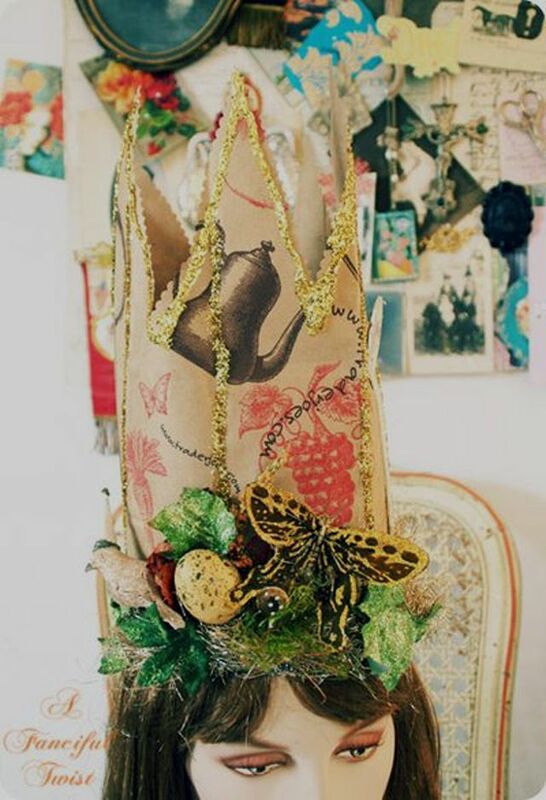 These paper party decorations will add a fantastic bohemian look to your next gathering. Wrap a foam wreath with crinkled strips of brown paper to get a beautiful organic paper wreath. Add some orange and golden silk flowers to the wreath for a gorgeous autumn themed home decor craft. It seems that every summer after a couple of weeks of freedom from school, children will complain that they are bored. When this happens, pull out some leftover grocery bags and get crafting. Have your kids make books out of the bags, and then fill the pages with summer memories. Transform a plain grocery bag into an impressive kite. Just decorate the bag as you wish, add some streamers and string and get out there and fly your kite. That is homemade fun that can't be beaten. The next time you are at a thrift store, pick up a couple of frames and try out this method for paper bag mats. A fun way to add texture and warmth to your home decor. Make this cute astronaut costume for your little boy or girl. Kids will have hours of fun pretending to be traveling in space. Paper Bag Astronaut Costume from Hideous! Dreadful! Stinky! Don't you think these paper bag costumes are just the cutest? Let your child be a dinosaur or unicorn next Halloween. What an economical and unique way to dress your kids up for the holiday. Make these ninja puppets with your children. These puppets are so much fun that you may find yourself playing with them too.